CrossFit has changed Coach Christie’s life in such a positive way. Prior to CrossFit, Coach Christie was a teacher for 7 years and she worked at a gym as a group fitness instructor for 5. She has always had a passion for teaching and fitness; now she gets to combine the two. CrossFit – The only sport where the loudest cheers are for the last to finish. Coach Jason has been a competitive athlete for most of his adult life! In high school, he competed in track and football. After high school he got into rodeo and spent a year as a bull rider. Then he got into endurance races. Coach Jason has run several marathons, half marathons, spartan races, and other mud runs. He has played seven years of sand volleyball and has also spent three seasons playing men's Division 3 rugby. It has been almost five years since he started his CrossFit journey, and he is sorry he didn't find it sooner! We will all struggle. Coach Jason sustained injuries to both his shoulders playing rugby. When he first started CrossFit, he could barely squat with the PVC pipe over his head. With the help of the coaches, he grew stronger and stronger every day. We all have to start somewhere. The hardest part is starting. Come on in, and we can get you where you want to be. Coach Kyle grew up playing several difference sports and had a very active lifestyle. In high school he started lifting weights and continued his fitness journey throughout his time in the military. He started doing CrossFit after his time in the service. He's been doing CrossFit a little over a year now, and couldn't imagine doing anything else within the fitness industry. Coach Anna loves being an athlete. She has played on many different teams since she was young - organized and backyard sports. She played basketball at the college level. She started CrossFit on her birthday last year and can't think of a better present to keep enjoying for the rest of her life. Coach Dave was born with a rhythm in his head and a melody in his heart. From a very young age he loved listening to music so much that he started playing music of his own. This is why he is always tapping! It wasn't until his mid-20s that he starting finding enjoyment in physical activities. As time went on, his interest was crafted into a passion that continues to grow. He discovered CrossFit roughly a year ago and has been hooked ever since his first OnRamp class. Coach Vee has been involved with sports her whole life. Started with soccer and then went into cheerleading, softball, volleyball, and even football. 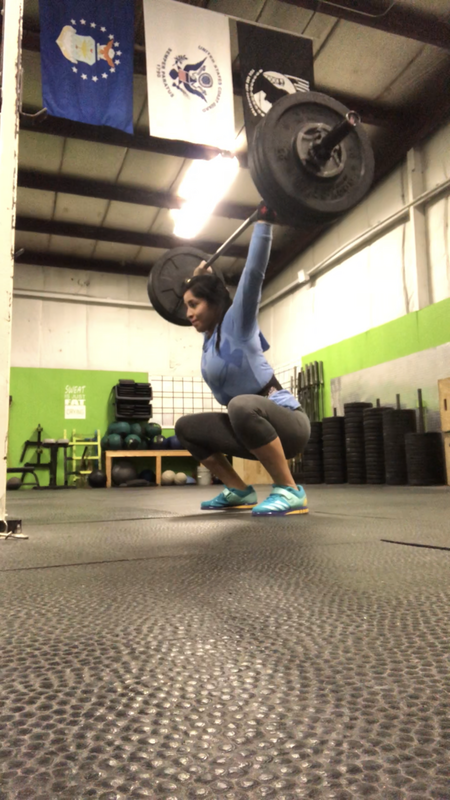 She found herself with a undesirable commercial gym routine before she came across CrossFit in 2017 and found her place. She is the oldest of 8 awesome siblings in her family. After receiving her CFL1 she immediately went for her CrossFit Kids Certification. Being able to help others and even kids, is what fuels Vee’s passion for fitness. Coach E was introduced to CrossFit back in February 2017. Little did she know CrossFit would change her life forever. Now as a coach she has fallen in love with the idea of not only helping others in achieving goals, but seeing the process unfold before her eyes. The opportunity to be able to assist those wanting to reach their full potential and overcome obstacles they never thought they would see the other side of is the reason she is a coach today. We are a very active couple. We have run half and full marathons together, ran and biked our way through Muddy Buddies, climbed over obstacles in Warrior Dashes, and destroyed our bodies at Spartan Races. We compete together on teams at competitions and support one another through all endeavors. We are ALWAYS looking for more people to participate in these fun events! The more the merrier!